On Fridays, I mostly review snack foods. That is because I love munching on things. I'm an avid snacker. One of my favorite parts of travel is that I get to try snacks from around the world. 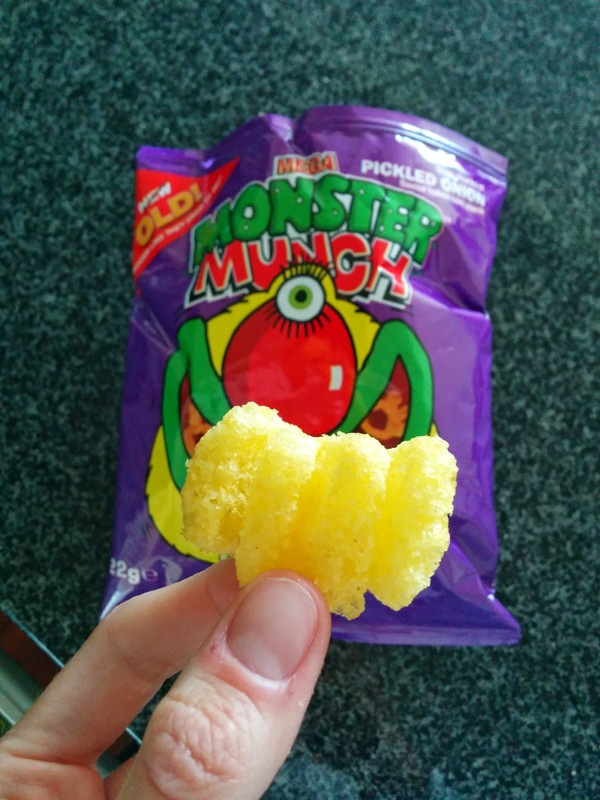 On a recent adventure, I discovered Monster Munch. New to me, but it has been around in the UK since 1977, manufactured by Smiths, whose products I have reviewed before. Monster Munch is baked corn snacks, in fun flavors, with, uh, monsters as the selling point. I think it is aimed at kids? Each flavor has its own monster to represent it. Over the years, the flavors have included ridiculous things like "beef burger", "spaghetti sauce", or "vanilla ice cream". I only tried one variety on this trip, but I'll certainly seek them out next time I'm in the UK! These are basically puffy, baked corn snacks, in fun monster shapes. They have a nice crunch, really light, with satisfying air pockets. The texture was just right. The flavor was crazy though, dubbed "pickled onion". It was slightly onion-y, yes. And tangy. I didn't really taste "pickles". But, I liked it. I think. Such a strange flavor. You may recall that several years ago, I reviewed a tiny little bakery in the Financial District called Cupcake Cove ... for their cookies. Yup, cupcake is in their name, and I only had their cookies. I just don't seek out cupcakes often, as I'm rarely impressed (as you probably know from reading my cupcake reviews). But recently, a co-worker brought in a box of assorted cupcakes from Cupcake Cove. While I may not seek them out, I'll obviously try any that are brought to me! Sadly, for a namesake item, they were not very remarkable. Assorted Cupcakes. $3 each, $30 / dozen. 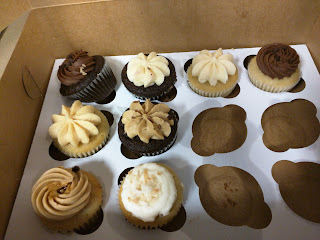 The box contained an assortment, but I had to guess at flavors, referencing the Cupcake Cove website as I went. I didn't get a photo until several had been snagged (including by myself, whoops), so there are a few missing, but I think our box contained one of every flavor offered that day. The cupcakes weren't the most exciting flavors. All had either vanilla or chocolate as the base cake (except for the carrot cake), and frosting varieties were vanilla, chocolate, peanut butter, and coconut. There were no interesting fillings nor toppings, no embellishments. I started with a dark brown cake with light brown frosting, not pictured here, since, uh, I already took it. I think this was the "Peanut Butter Frosting / Chocolate Cake" option. The cake itself was moist, gummy, and not very interesting. The frosting was rock solid, and had no real flavor to it. I'm guessing it was the peanut butter, since it was lighter colored than what I'm guessing was chocolate, but it didn't taste like peanut butter in any meaningful way. I moved on to the unique one, the "Cream Cheese Frosting / Carrot Cake". It was much better, a decent carrot cake base, loaded with nuts and bits of carrots. The cream cheese frosting was fluffy, generously applied, and had a nice cream cheese flavor, so that part was quite was good. But, at the end of the day, it was just a standard cupcake. Muracci's is a super casual Japanese restaurant in the Financial district. Open only during the week, for lunch and early evening only, so not somewhere I've had many opportunities to visit. They have a very small seating area, basically just a couple stools up against the front window, but nearly everyone takes the food to go. The space is kinda funny, a long narrow hallway basically, where everyone lines up, leading to the register deep inside the space. The line always spills out onto the sidewalk at lunchtime. Once you order, and get your food, then you have to squeeze back through everyone. I'm not sure how they could do better though, the space just isn't very big. The menu is mostly Japanese-style curries with rice, although they also have noodle soups, a small sushi menu, and some side dishes. I'm not one for curries, so I opted for sushi and sides, none of which were very good, but, the curry really is what they are known for. Oh, they also have packaged mochi, which I did enjoy, but somehow didn't get a photo of. I'm losing my edge. This is certainly the most unusual potato salad I've ever had. Perhaps this is normal for Japanese potato salad? It had ... broccoli and corn. Uh, what? The potato itself was also strange, it was .. almost mushy? Like chunky mashed potatoes, not distinct pieces of potato. I can't say this was a bad thing exactly, just, very different. However, there wasn't much flavor. It was certainly not overdressed, which is probably my most common complaint with potato salad, but I still am not sure there even was a dressing in this. 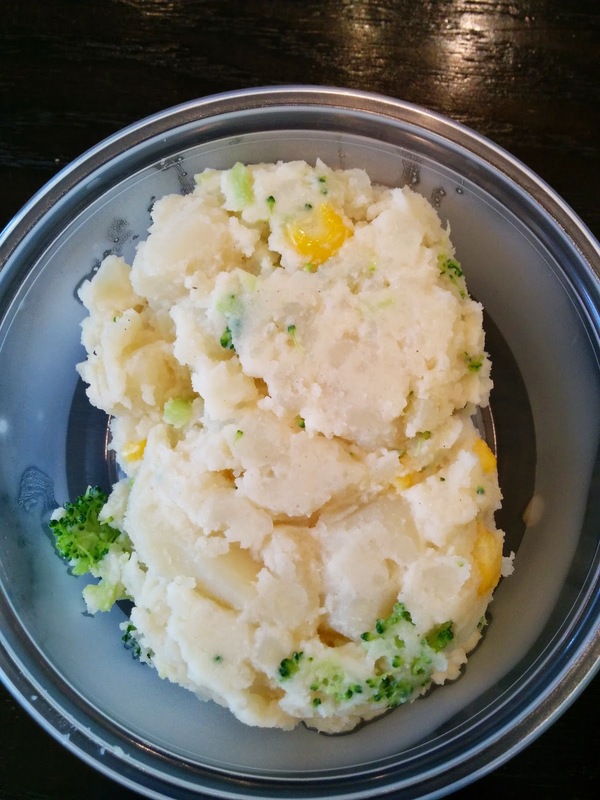 It really might have just been potato, corn, and broccoli. I'm glad I experienced this as a totally different form of potato salad, but I wouldn't get it again. $3.75 price was fine for a container of potato salad. 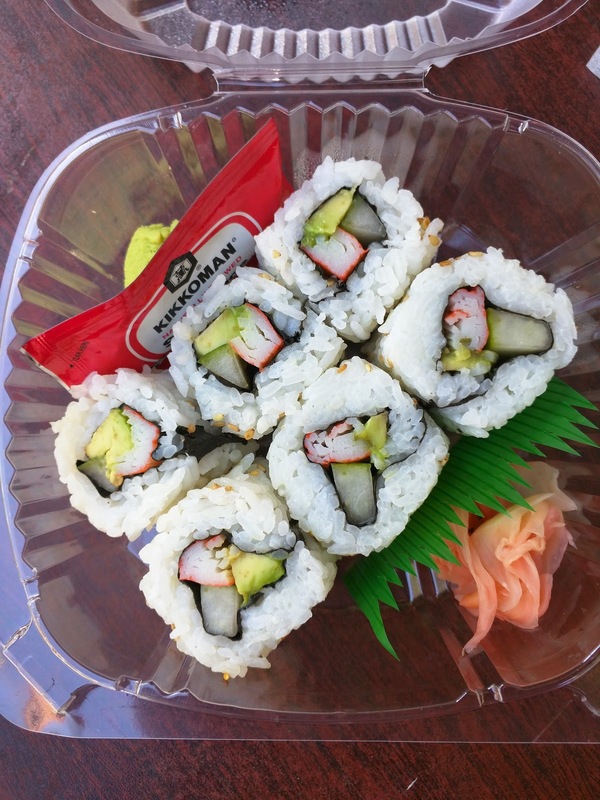 Muracci's has a small sushi menu, consisting of 3 types of rolls (cucumber, avocado, or California) and inari. All are prepared in advance, ready to grab-n-go. I was really craving sushi, and while I didn't expect Muracci's to have anything all that high quality, inari is usually a pretty safe bet. It was ... fine. 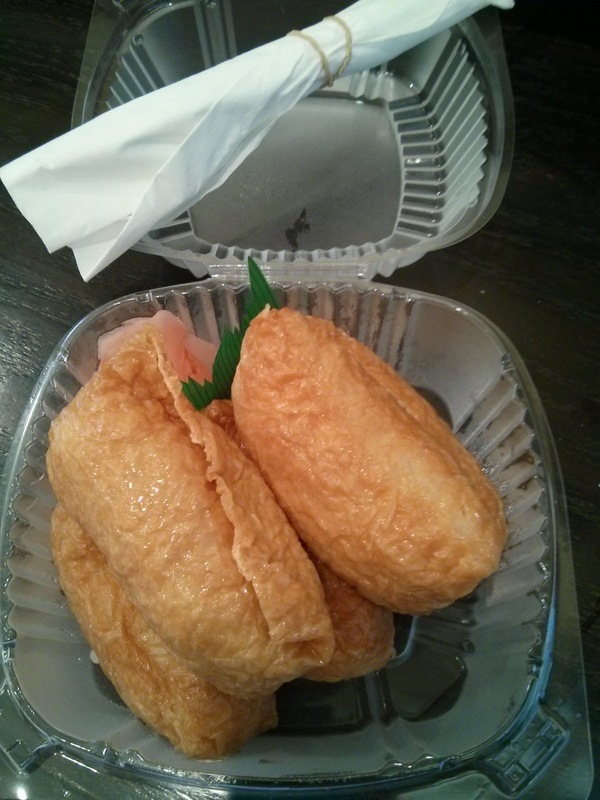 The inari skin was slightly sweetened, it was well wrapped. But, I didn't care for the rice inside and each piece was very generously stuffed. It was white rice, but tasted somewhat like brown rice. I think possibly due to the sesame seeds that were also in there? The rice was slightly sticky, but didn't seem seasoned, besides the sesame seeds. The portion of 5 huge inari was great for $3.95, but I'd prefer an option to get fewer, although I wouldn't get this again anyway. Well, this was not very good. The rice was mushy. The nori wrapper was completely soggy, actually hard to chew through since it was so soggy. The sushi clearly was constructed much earlier in the morning, although the cucumber was crunchy and the avocado not too brown. The crab was crab stick, fishy tasting. Wasabi, ginger, and a soy sauce packet were included in the box. Oh, and a fake sprig of grass. I don't think this was even worth the $3.75 price. 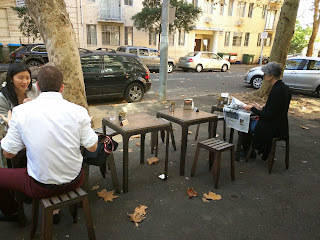 Several years ago, I lived in Sydney for 3 months, in Surry Hills. I loved the location for many reasons, but one compelling reason was the fact that the apartment I found to rent was located on Bourke Street, just down the street from Bourke Street Bakery, now quite the Sydney institution. 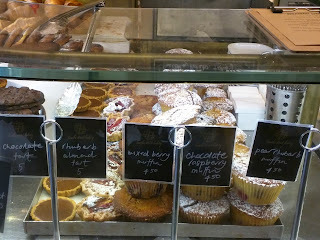 I probably discovered Bourke Street Bakery on my first visit to Sydney, years ago now. 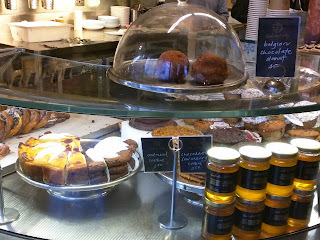 Sydney locals, knowing my love of baked goods, recommended it to me for one of their most unique treats, the ginger brûlée tart, and to Ojan for the sausage rolls. 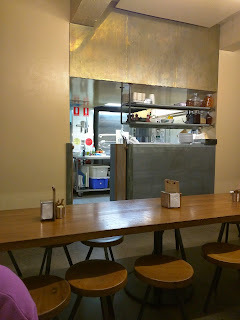 I was totally overwhelmed the first time I visited that original Surry Hills location. The lines were crazy long. It was hard to see what amazing treats they had to offer through the crowds. It was frantic when you finally made it to the counter to order. There were perhaps 2 tables outside, but no other seating. But ... it quickly became a favorite for Ojan and I. We'd swing by to pick up treats to bring on our weekend excursions, or to grab a chocolate milk, our amazing discovery. 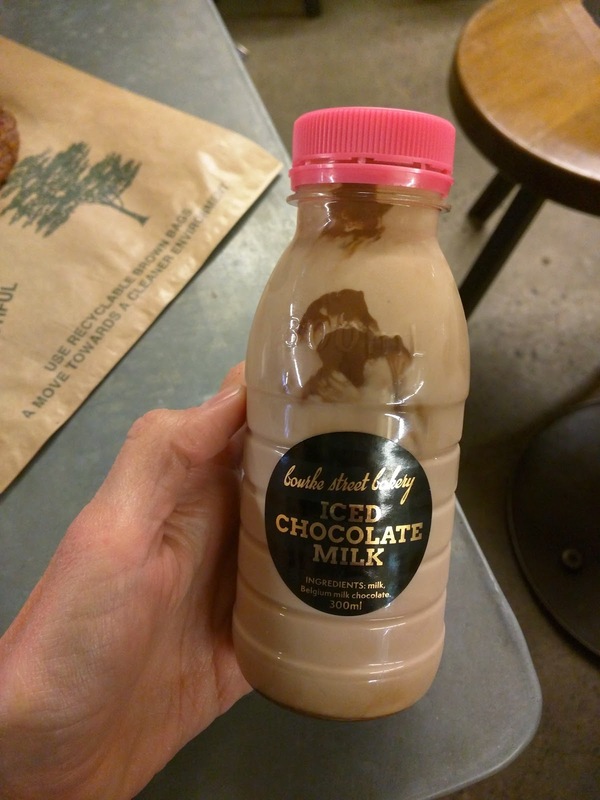 I know it sounds crazy to go to a bakery and get the chocolate milk, but it is seriously the best I've ever had. Anyway, fast forward to now. Bourke Street Bakery has expanded and flourished. They have 8(!) locations in the greater Sydney area. On this visit, we decided to seek out a different location, the one in Pott's Point (another area I stayed in during a previous Sydney trip). I was curious to see what the larger location would be like. We invited another friend along, who had just landed in Sydney a few hours prior. I am glad we visited, and was glad to see that some items still lived up to my memories! We recognized the signature Bourke Street Bakery logo instantly, but the classic sign that you had reached Bourke Street Bakery was absent: the crazy line! Here, there was no line down the sidewalk. It looked ... calm. 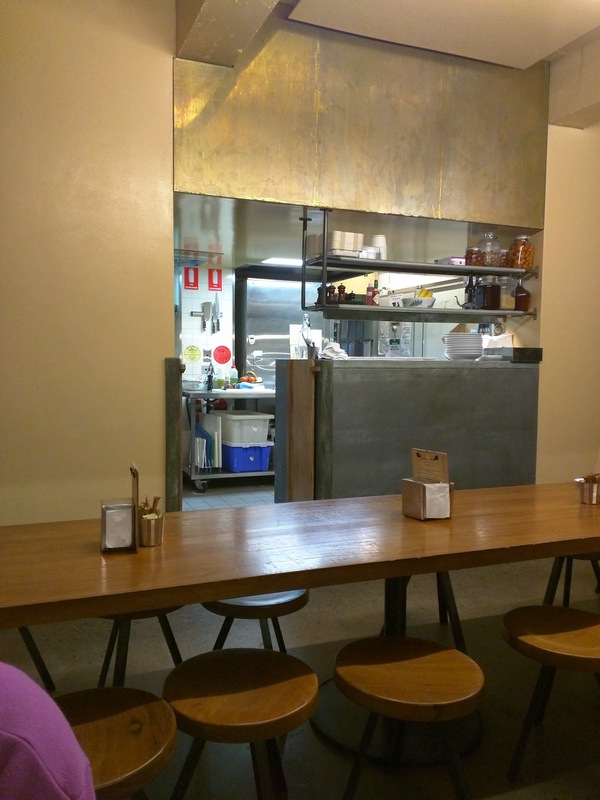 And unlike the Surry Hills location with only a couple tiny tables outside and no indoor seating, the Pott's Point location has seating options. A few small tables are located on the sidewalk. It was a bit chilly though, so we headed inside, where numerous other seating options were available. This is a major distinguishing factor of this location. Seating! OMG. Along one wall is small tables for two. 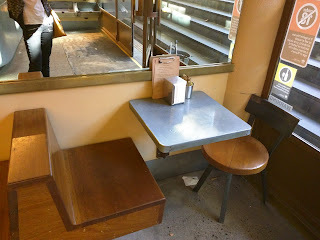 The bench seating wasn't very comfortable, since the back was too low to sit against. The stools didn't look very comfortable. The main seating area is in the back, with side tables along the wall, arranged for groups of two or four. In the center of the back room is a long communal table with more of the little stools. Overall, the interior wasn't great, not very comfortable, and I'm just not sure what ambiance they are going for. 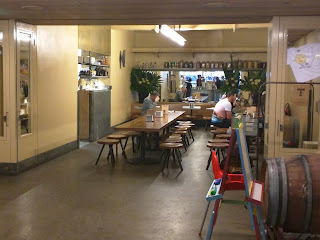 Still, it was nice to actually have a place to sit, unlike the Surry Hills location. A kitchen is also located back in that area, semi-open, but I didn't see any cooking going on. 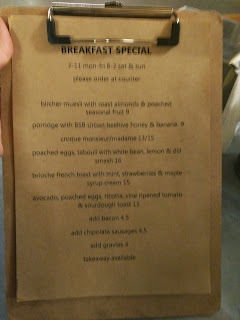 Bread menu, breakfast menu, pie and sausage roll menu. 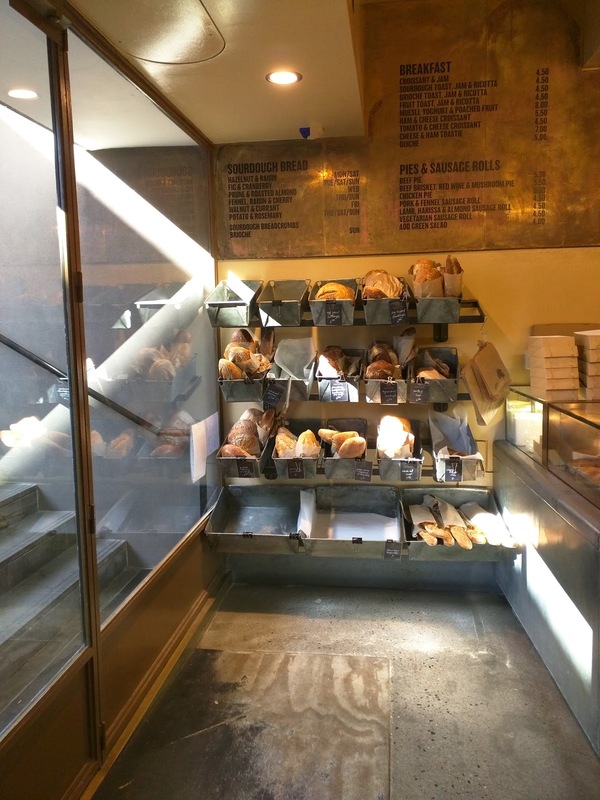 The first thing you see when you walk in is the fresh baked sourdough breads. The bread menu, a breakfast menu, and the pie and sausage roll menus are displayed above the breads. The sausage rolls at Bourke Street are known to be among the best in Sydney. They are available in many varieties, including pork and fennel, lamb, harissa and almond, chicken pumpkin tarragon, or even vegetarian. One of our friends got a sausage roll on this visit, and said it was quite good. Ojan used to get them regularly. 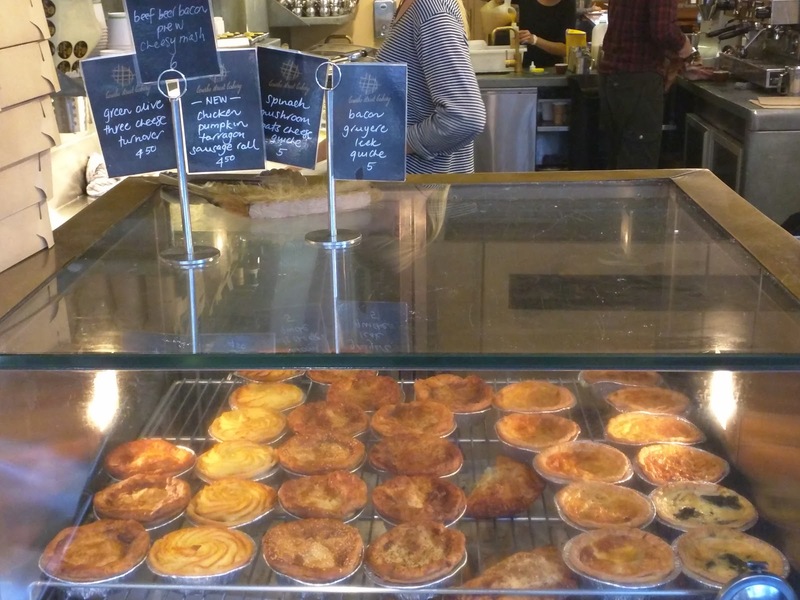 Another Australian thing is of course meat pies, available here as classic beef, beef brisket with red wine and mushrooms, chicken, or the daily special of beef bacon pie with cheesy mash on top. I remember getting one years ago, but I don't recall anything more about it (I was probably just trying to eat something with protein before diving into my pastries). 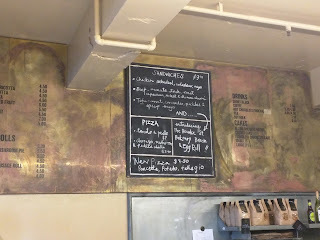 Our friend got the brisket pie this time, and again, said it was quite good. He was happy with his savory choices. The breakfast menu included quiches of the day, some savory croissants (ham and cheese, tomato and cheese), and basic toasts and croissants. All of these items will all be heated up for you, and delivered to your table when warm. Daily Menu and Drink Menu. 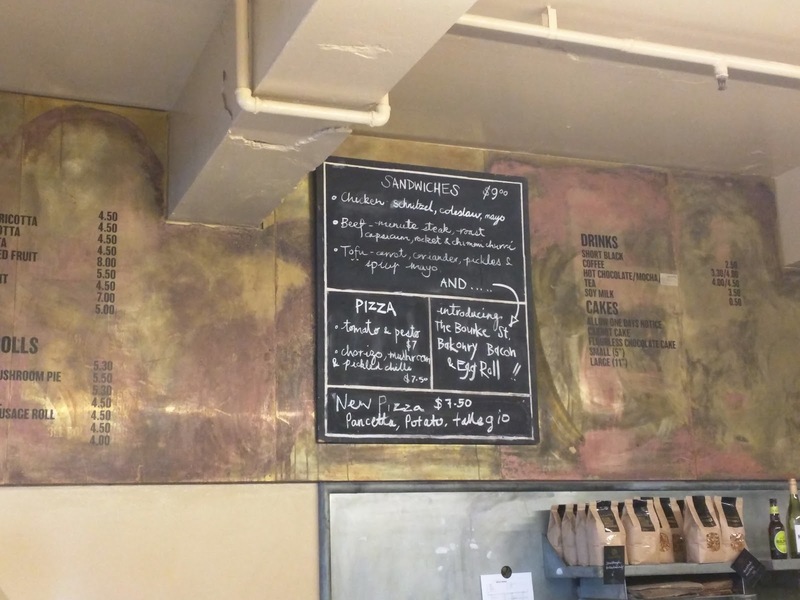 Along the wall behind the main counter is a chalkboard menu with the daily offerings for sandwiches and pizzas, since those change daily. Beside that was the hot drink menu, all standard coffee bar offerings. 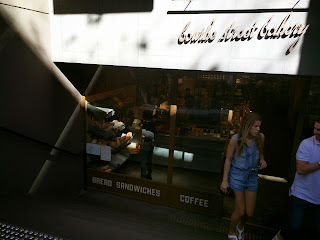 The other Bourke Street Bakery locations are just bakeries. They feature all the items listed above, plus tons of baked goods, but no real entrees. The Pott's Point location is unique in that it has more extensive food offerings, with clipboards listing out a full breakfast menu. I was very tempted by many of the items. Bircher muesli I adore, and it comes topped with roasted almonds and poached seasonal fruit. Or the porridge with honey and banana. 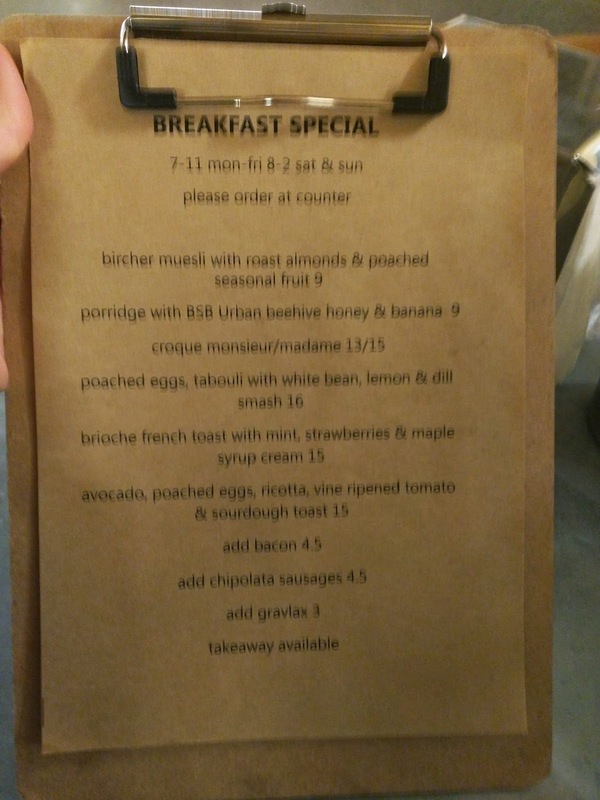 These may sound boring, but they really do these dishes well in Sydney, totally different from what you get in the US with a bowl of simple oatmeal. And of course, it was hard to resist the brioche french toast with mint, strawberries, and maple syrup cream. But, we already had a huge breakfast feast at our hotel buffet earlier that morning, so, just a light meal was in order. Plus, it was nearly 2pm, not exactly the time of day that I'd like breakfast. Meat pies, cheese turnovers, quiche. 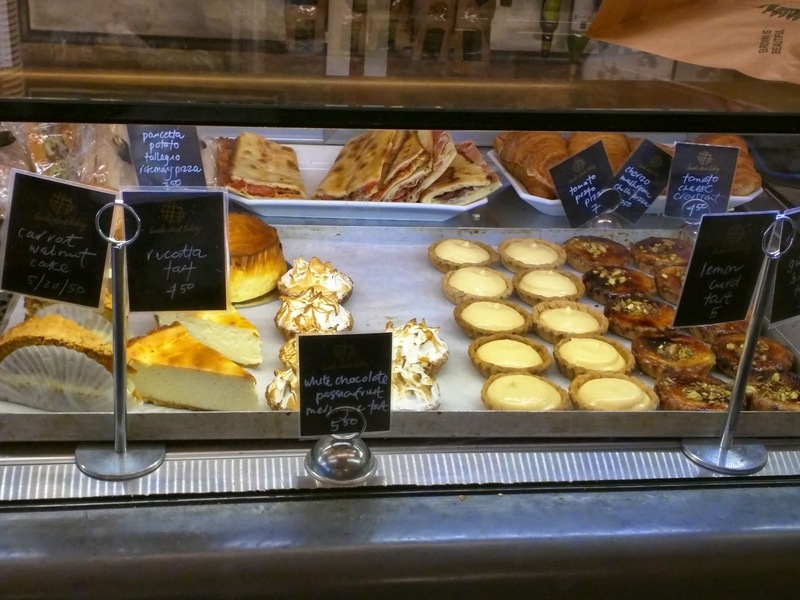 So, getting into the baked goods, the real reason to visit a bakery, right? 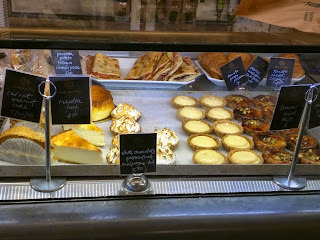 Right in the entrance, past the breads, is the expansive front counter, with all the baked goods laid out on display. First was some savories, meat pie specials and quiches. Next up were croissants (plain, chocolate, or almond praline), danishes (rhubarb), and pain au raisin. They looked flaky and delicious. 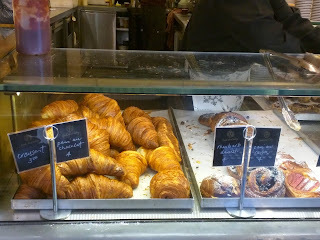 I really wanted to try the almond praline croissant! Next up were slices of cake (Pear & Raspberry Butter Cake, Flourless Chocolate), cookies (oatmeal, chocolate and sour cherry), and Belgian chocolate stuffed donuts. I almost got a donut. How do you not? Continuing on, we were reaching the really good stuff. You know how much I love my baked goods. Three types of muffins were available: mixed berry, chocolate raspberry, and pear rhubarb. The muffins change with the seasons. I remember getting many muffins during previous trips to Sydney. We'd often get them to take the beach or on walks. I always loved them, and was very tempted to get one this time too. For tarts, there was chocolate or almond rhubarb. I know we got the chocolate tart once before, years ago. And continuing ... now the REALLY good stuff! In the back were slices of pizza and savory filled croissants. The savory croissants are actually just the plain croissants, sliced open and filled with cheese and other fillings, then warmed up when served (rather than baked in, a slightly different approach than normal). I very strongly advocated to get one for our savory offering, since it would be an excuse to try the croissants, but, Ojan wasn't interested and we were splitting. In front were slices of carrot walnut cake and ricotta cake, and a slew of tarts: white chocolate passionfruit meringue, lemon curd, and the aforementioned ginger brûlée. I loved the looks of the meringue! The other side of the entrance area has a cold drink case, self serve. All orders are taken from a register behind the main counter. You wouldn't expect a bakery to make excellent cold drinks, but Bourke Street Bakery does. Like the amazing chocolate milk. OMG. 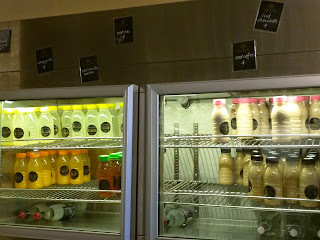 They also offer iced coffee and iced chai plus lemonade and pear & vanilla iced tea. Chorizo, Mushroom & Chilli "Pizza". $7.50. We wanted one savory item, and Ojan decided that given the heavy food we'd been eating throughout the trip, a meat pie or sausage roll were not in order. And he vetoed my savory croissant pick. Thus, we got a pizza. I didn't really care what type, so I let him select, and he went for the chorizo. 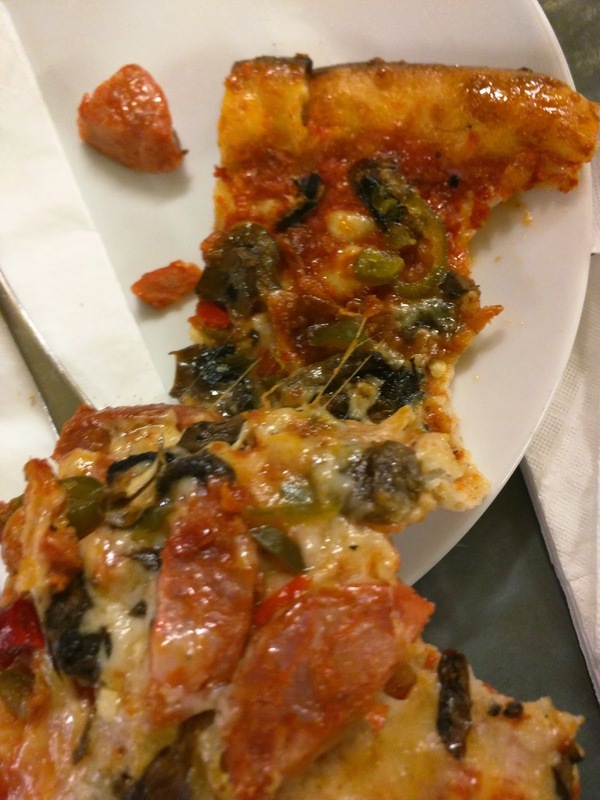 It wasn't really what I think of as pizza, as, well, it had crust on two sides. 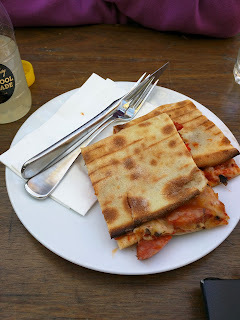 But it was also not a calzone, as the fillings weren't baked in, and the dough didn't wrap around. This form factor was actually pretty nice, basically a pizza sandwich, portable and easy to just pick up and eat. The crust was thin and light, nicely crispy. Inside was melted cheese, chunks of slightly spicy chorizo, bits of mushrooms, and chilies. It was heated up, but, not sufficiently. It was only lukewarm, and certainly needed to be much hotter. I wish we'd asked for it to be heated more once we realized how barely heated it was. Overall, it just wasn't very good, but I thought it was interesting, and a nice easy option, a decent value for $7.50. To go along with the savories, we also opted for some cold drinks. One of our friends ordered the iced tea and said it was quite good, refreshing. Ojan opted for a lemonade ($3.50). I tried a sip and thought it was way too tart, but Ojan really liked it. When I said it was too tart, his comeback was "That's what makes it good! It actually tastes like lemon. If I wanted to drink sugar water, I'd just drink some simple syrup". Well, good enough point I guess, and I'm glad he liked it. After our savory food, it was time to move on to desserts, the real reason we (or at least, I) were there. We started with drinks. Ojan opted for the hot chocolate that he fondly remembered (I always loved the cold chocolate milk, while he preferred the hot chocolate). 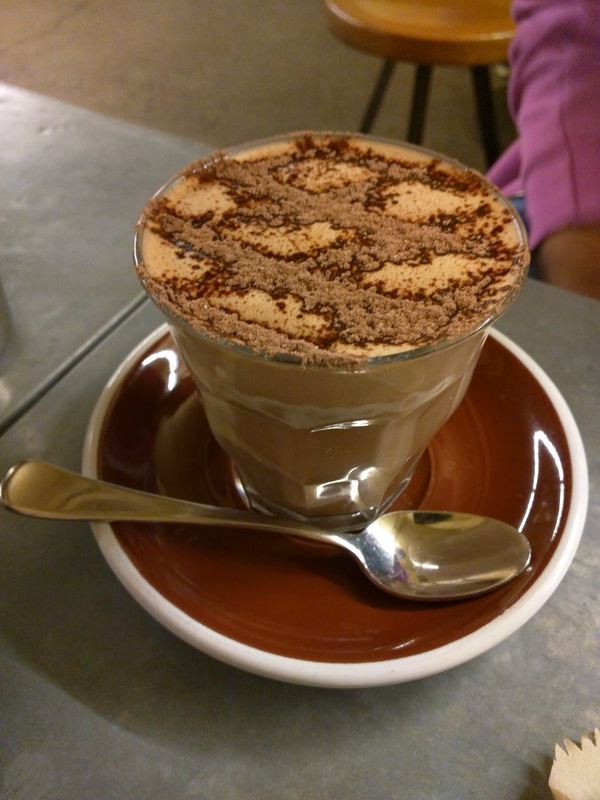 To be honest, this hot chocolate was pretty much the reason Ojan was there. And ... he absolutely loved it. Over and over he said how much he liked it, and how it actually lived up to his memory. His accolades were so great that our friend dining with us eventually got up to order one himself, and he also enjoyed his. I wasn't very into it, but I don't generally want hot chocolate. It was dark, rich, and chocolately, with a beautiful foam layer on top, sprinkled with additional cocoa powder. $4 price was good for a real hot chocolate. 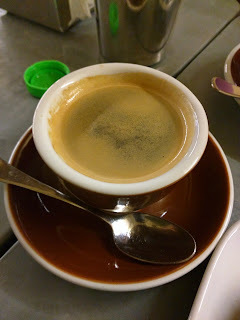 I opted for just a simple long black, since I love something bitter alongside my sweets. It was good, particularly for decaf. Sooo strong. Very dark brew. No sweetener nor milk was needed here, and it did indeed pair perfectly. As I said earlier, the iced chocolate was my fondest memory of Bourke Street. While I don't go for the hot chocolate, this iced chocolate, aka, chocolate milk, was always amazing. I got one to go, and looked forward to drinking it the next morning after my workout. Chocolate milk is one of my favorite recovery drinks! Who needs protein shakes? It was everything I wanted it to be. The top layer was basically chocolate cream. Yes, really. They use full cream milk obviously, but I think they must put something more in there. The top, the lid, the sides of the bottle, are filled with a thick cream, like a pudding, chocolate flavored. This is my favorite part, and I always grab a little spoon and eat it like pudding. Sooo good. Yes, you can just shake the bottle and mix it in but ... I love it this way, savoring the cream. The milk itself is rich, chocolately, and well just delicious. You do want to shake it at some point since tons of chocolate sauce settles on the bottom. I adore this milk, and will gladly pay $4 for it anytime. My protip: if you ever visit Bourke Street Bakery, get one of these to go at least. You'll thank yourself, and me, when you find it in your fridge later. Ojan also got something for the road: a cookie. 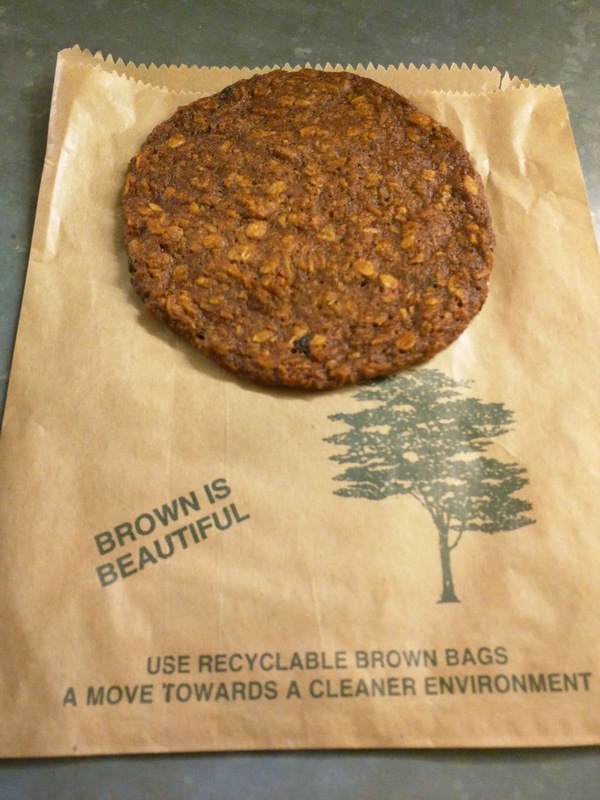 It was a thin, crispy cookie, although quite large in diameter. I'm not a cookie fan, but I obviously tried a bite. It was very oaty, but, uh, not in a healthy tasting way. It was very buttery, and sugary, almost caramelized. Ojan thought that this might be the rare cookie that I actually liked, since it was so decadent. He was right, except that I'd want to crumble it up, and use it on ice cream, pudding, or some other dish, as a component. Just a cookie is never interesting enough for me. The $3.50 price was fine for a large cookie, perhaps a bit high? I selected the ginger brûlée tart, one of their signature items. 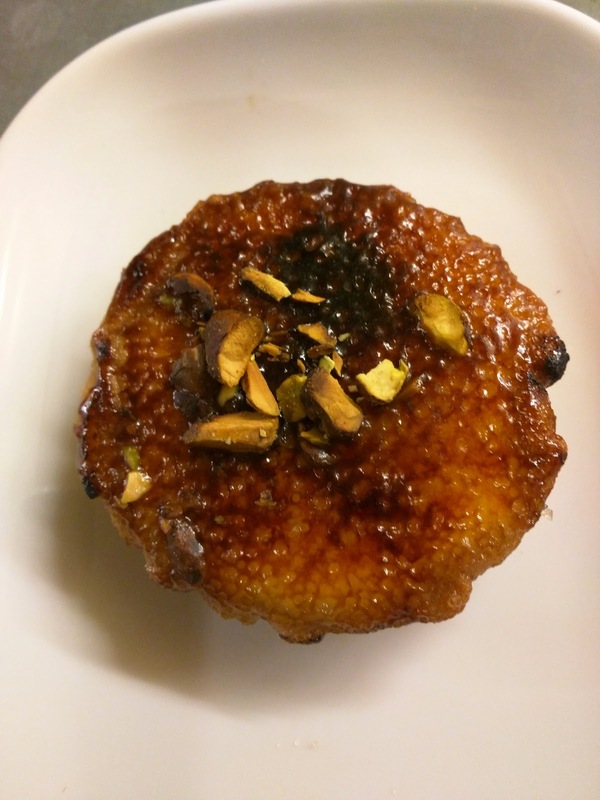 It is an interesting creation, basically a ginger infused crème brûlée, topped with a few pistachios, but baked into a tart shell. Like the "pizza", the theme here seems to be easy portability, which certainly makes sense given that their other locations have no where to sit. Being able to eat all the treats with your hands is a big plus. I cut it open to show you the glory better. The custard was fairly standard custard, nice enough. The ginger infusion is interesting, but honestly, I'd prefer it without. Not that I don't like ginger, but, I dunno, I just don't love it in crème brûlée . The top is a standard brûléed top, slightly crisp, great thickness, nice bitterness. It is not brûléed to order obviously, so you miss out on the nice temperature contrast you get with fresh crème brûlée though. 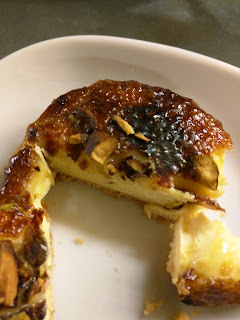 The tart shell was crispy and hard to cut, but, you aren't really meant to cut it anyway. It wasn't particularly good nor bad. Overall, that is how I felt about the whole thing. It wasn't good nor bad. It was fine, I liked it well enough, but I have no desire to get another. I used to love these though. The $5 price was fine, although it is a small item.